Slightly more than a week has passed since we attended the Indianapolis 500 and time to finish reflecting on examples of The 8 Essential Skills in action. Skill 7 – Leading & Empowering: I saw examples of Leadership and Empowering behavior from the time we walked in the gate at IMS. With few exceptions, and I mean really few, the staff know their jobs . . . own their jobs, whether they are full-time, temporary, or volunteer. There has been quite a bit of change at the top of the organization in the past year as Tony George was forced out as CEO and head of the Indy Racing League. And sometimes that sort of change can throw a lot of people off their game. Not in this case. You can see leadership in crew chiefs managing their pit crews, race strategists adjusting to changing conditions and challenges while maintaining an overall race plan. It’s not quite choreography, but more a large, fluid team, all committed to helping create the Greatest Spectacle in Racing. Skill 8 – Growing Yourself: Over the years I’ve watched a series of drivers develop from rookies into seasoned veteran drivers. Team owners like Bobby Rahal and Michael Andretti graduated from the ranks of champion drivers. Their sons have “gone into the family business” and are now drivers. Sarah Fisher was a rookie in 2000 and Danica Patrick was a rookie in 2005. Both are seasoned veterans now and the 2010 race had five women drivers on the starting grid. The Indy 500 is the pinnacle of oval-track racing and to win one 500 is a remarkable achievement and is usually the result of years of preparation. Winning four 500’s like Al Unser, Rick Mears, and A.J. Foyt have takes a huge commitment to getting better all the time. It was interesting to look for The 8 Essential Skills while at this year’s Indianapolis 500. Let me know when you spot examples in your own travels. During the past 25 years Harry had built a successful trucking business. The company had grown from four employees and three trucks to 150 employees and a fleet of more than 100 vehicles. Harry was nearing 50 and wanted to slow down a bit. Most of his management team had been promoted from within, typically starting behind the wheel of a truck or in an entry-level office job. As founder and CEO, Harry had been the focus of the business for 25 years: making the decisions, guiding and building the team, regularly driving trucks just to remember where he came from, and otherwise acting as the center of the universe. He expected his long-time, dedicated employees to now make more decisions and take more initiative. Unfortunately, his “at the center of everything” approach for so many years meant his managers had little ability and willingness to step up to their new role; they hadn’t been properly prepared. Harry had great difficulty letting go and was visibly impatient when his managers didn’t immediately rise to the challenge. The management team expected Harry to stay around and be “daddy” for a lot longer so they wouldn’t have to make tough decisions. As an organization grows and expands, the role each person plays is likely to change too. Harry and the managers had mismatched expectations. Harry failed to understand that his expectations for sudden independent decision making were unrealistic given his history of having to be at the center of everything. The managers didn’t understand why their usual expectations suddenly weren’t being met. What would you have done in Harry’s situation? Both leadership and management involve acquiring and developing knowledge, skills, attitudes, and behaviors. 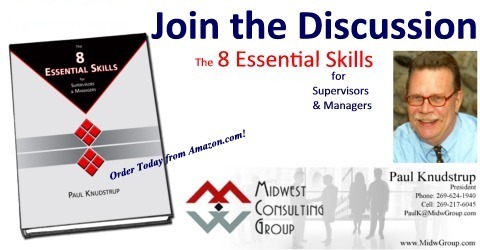 Once you are reasonably adept at Skills 1 through 6, you will be ready for Skill 7 – Leading & Empowering. What do you think? How do you go about leading your team to success? Are your employees truly empowered? How did you get that to happen? Let us know what works for you.